We have some news for those who ever want made career in Medical Technologist. 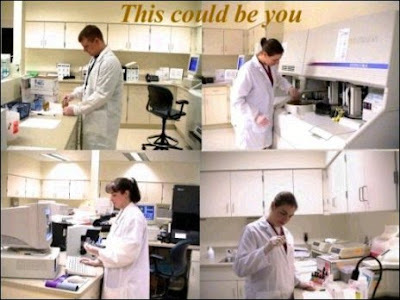 Here you can apply for the medical Technologist post. As a Medical Technologist you have perform a clinical tests in Molecular Diagnostics, including DNA/RNA isolation, PCR, Invader analysis, Real-time PCR, capillary electrophoresis and sequencing. You also give guidence if residents and students. Equipment and reagents to perform QC. Research and development of new assays to participate. Laboratory to participate in continuing education lectures and meetings. These all are the responsibilities at your work. Qualification:- BS and MT or Equivalent combination of education with the experience certificateor Registration by applicable health agency. You have ability to be eligible to certified or registered required.